Philip Battaglia, asked me to submit to you his pictures of his grandfather, Fr. John Hynes with Eng. 214, taken in Sept. 1938. These were the old quarters when E. 214 was located on Herkimer St. Brooklyn, before the move to Halsey St. The apparatus is a 1938 Ahrens-Fox 1000gpm piston pumper. FDNY received twenty of these in 1938, plus six similar, but not identical ones in 1939. They also had two more similar, but not identical ones delivered in 1938 to the NY Worlds Fair and turned over to FDNY after the Fair closed in 1941. 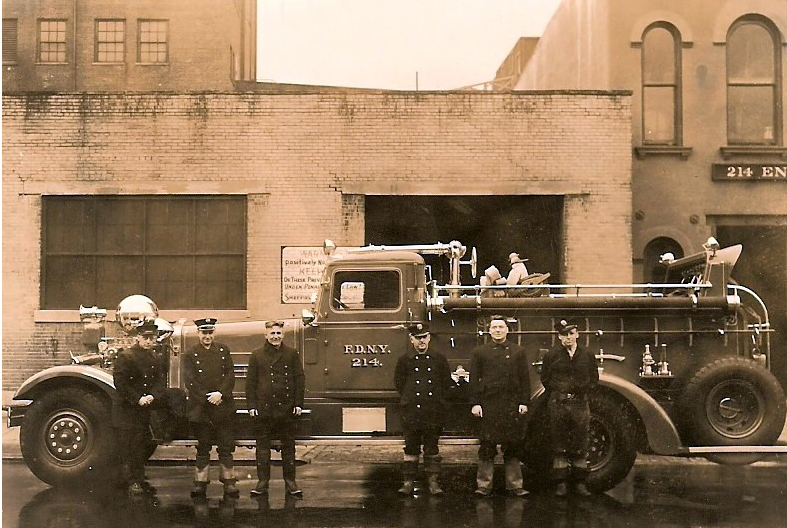 The one assigned to Engine 214 had FDNY registration # 3437 and was assigned to them on 6/25/38 replacing a 1922 AmericanLaFrance. It stayed at Engine 214 until 2/21/48 when 214 "swapped" rigs with Engine 222. Engine 214 was temporarily quartered with Ladder 111 in February 1948 in their small, old house at 399 Halsey Street, while the new house at 495 Hancock Street was being built. They did not move into the new house until 4/26/57, with Ladder 111 coming two months later. Engine 222 had a much smaller 1931 American LaFrance 700gpm pumper which was a better fit in the old house than the big Ahrens-Fox of Engine 214. That was the reason for this very rare "swap" of rigs. Engine 214 kept the 1931 American LaFrance, until getting a new 1952 Ward LaFrance 750gpm pumper on 10/29/52. The 1938 Ahrens-Fox (registration # 3437) stayed assigned to Engine 222 until replaced on 3/7/58.